On the day of Macau’s handover in 1999, Man-Cho (Chi Lam Cheung), Kiki (Joe Chen) and their neighbors were celebrating Aunty Q’s birthday (Nancy Sit). Kwan-Ho (Charmaine Sheh) migrated to the US for some years and she made a surprise appearance at the birthday party. Despite the jovial ambience, Man-Cho noticed that Kwan-ho is strangely quiet and seems troubled. A movie continuing from where the award-winning drama left off 15 years ago, the “Return of the Cuckoo” is a film die-hard fans of the on-screen couple Chilam Cheung and Charmaine Sheh will love to watch. I have yet to watch the drama before watching the movie, so I won’t be able to tell you much from that perspective. But director Patrick Kong is the director of a few of my favourite Hong Kong romantic trilogy starring Alex Fong and Stephy Tang – Marriage with a Fool (2006), Love is Not All Around (2007) and L for Love, L for Lies (2008). Known for his ending twists, he made me look forward to what sort of outcome will there be for this film. For movie-goers who had not watched the drama too, it will be advisable for you to catch the recap trailer that the film had prepared prior to watching this film, in order to better appreciate the scenes. Based on the trailer, there were a few nostalgic scenes that will bound to bring back memories such as the piggy-back, the blowing of whistle and the working together as Macau tour guides. There wasn’t much to fault the skills of the veteran actors. Charmaine Sheh and Chilam Cheung were great, the supporting actors didn’t have much scenes to work with except to look happy or worried, plus tag around Auntie Q (Nancy Sit) wherever she go. I was a tad disappointed when they did not try to put any flashback scenes from the drama to refresh audience memories or explain the significance of the actions. A new addition to the original cast, I personally think Kiki (Joe Chen) a born-mute was a delight to watch. With her emotions expressed via sign languages and expressions, it was painful to witness a muted unrequited love, as well as the several vicious (but some cheesy) twists in the film. While this is no Cinderella with happily ever after, it has a nice albeit heartbreaking ending which leaves audience with a bitter-sweet aftertaste. While the original theme song 《祝君好》is sang by male lead Chi Lam Cheung; the cover version for the movie is sang by Singapore singer Kit Chan 陈洁仪. The sign language used in this filmed is guided by charity organisation “Silence” (龙耳) with Chilam Cheung as their sign language ambassador. While the movie is said to have started where the drama have left off, there were several significant differences. In the drama, Man-Cho (Chi Lam Cheung) and Auntie Q (Nancy Sit) left Macau and moved to Mainland China, but in the movie, they were still in Macau. In the drama, Kwan-Ho (Charmaine Sheh) and Szto Lai-Sun (Steven Ma) met Man-Cho (Chi Lam Cheung) in Zhongshan after returning from America to stay permanently in Macau, but in the film, Kwan-Ho met Man-cho in Macau. Kam Sing (Michael Tong) became the boss of a Pastel de nata, Portuguese egg tart franchise in Mainland China, but in the film, he became a casino boss. When the drama was aired 15 years ago in 2001, it was so well-received that it became a drama which has the second highest rating in the past two decades. Till today, it is still one of Hong Kong’s classic drama. After filming the “Return of the Cuckoo” drama, Chilam Cheung and Charmaine Sheh did not work together in any dramas for 14 years, but their chemistry was still good, according to director Patrick Kong. They were in the same movie “Triumph in the Skies” earlier this year, but had no scenes together. Rua da Felicidade (福隆新街) was one of the filming location for the drama. 15 years later, this place was used as the filming location once more, attracting countless locals to support the casts. Check out Return of the Cuckoo (十月初五的月光) Facebook Page! 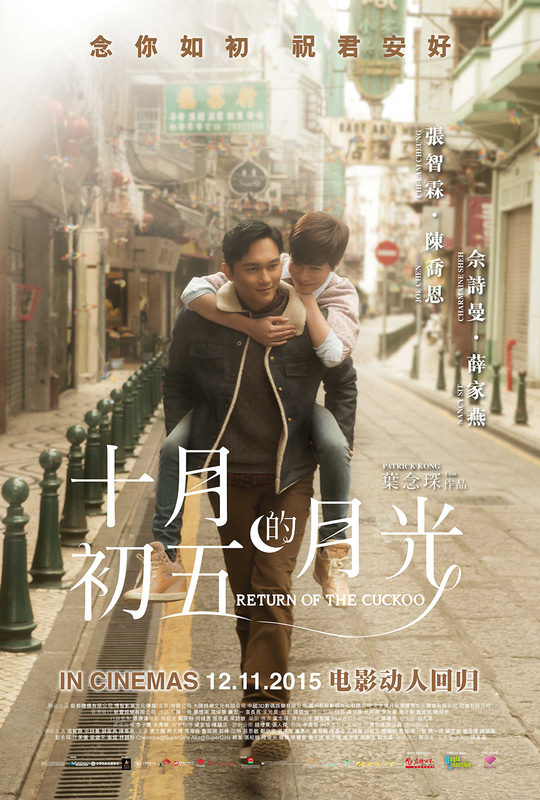 Return of the Cuckoo (十月初五的月光) is out in cinemas on 12 November 2015. I’ve just watched this drama like a few weeks ago. I didn’t have a chance to watch it when it just came out. I cried.. I would totally recommend you to watch it again, 20 eps :DD I love this drama so much. I am hoping to watch the film soon. I should watch the first movie and the sequel. It does look like a classic. Man Cho has lost his memories at the ending. Such a plot twist. And it doesn’t really gave a clear ending between Man Cho and Kwan Ho’s relationship. Therefore, I don’t really like the ending. I think I will be skipping this movie. My friend has watched it and she said is very predictable. The only reason she watch is Chi Lam & Charmaine. I would love to watch this one. Even if I didn’t know these actors. 🙂 But it seems to be a movie of my genre. I love the story plot and really takes it to next level romance movie. Don’t know some actors here but I think, they are awesome and versatile. Oriental movies are very good in plot and also the actors and the actresses could emote well naturally. I think this will be an absolute tear-jerker! I don’t think I can go through the whole movie without crying. I was pleasantly surprised at Joe Chen’s performance of Kiki. Sure, the story literally rained on Kiki’s parade. I am glad this movie will make a good addition to Joe Chen’s international works portfolio. I want to watch this movie! These two veteran artists are well-loved. They can move audiences to tears with their acting.